Some people like quiet computing, others like the wind tunnel experience. Personally, I fall somewhere in the middle. The winding hum of fans whisking air through my rig is calming for me; much like vacuums to a baby. However, I am not the norm, oddly. Many of today’s users seem to look towards a peaceful experience in front of the keyboard instead of the days when we thought having a computer that sounded like a hovercraft was cool. A few companies have made a name for themselves by offering peripherals and devices that marry performance with peace and quiet. Nexus thinks they have the proper balance with their new FLC-3000 (R2). First off, any company that uses a web address like http://www.stopthenoise.com instead of their company name is serious about their claims. All of their products are geared towards quiet computing and this is blatantly evident by a flash scroller that features even a quiet mouse that features silent switch technology! There are a slew of things that set this cooler apart from the rest of the pack. The first and most obvious is that the cooler is neither horizontal or vertical, instead it is designed to sit at an angle of 30 degrees. 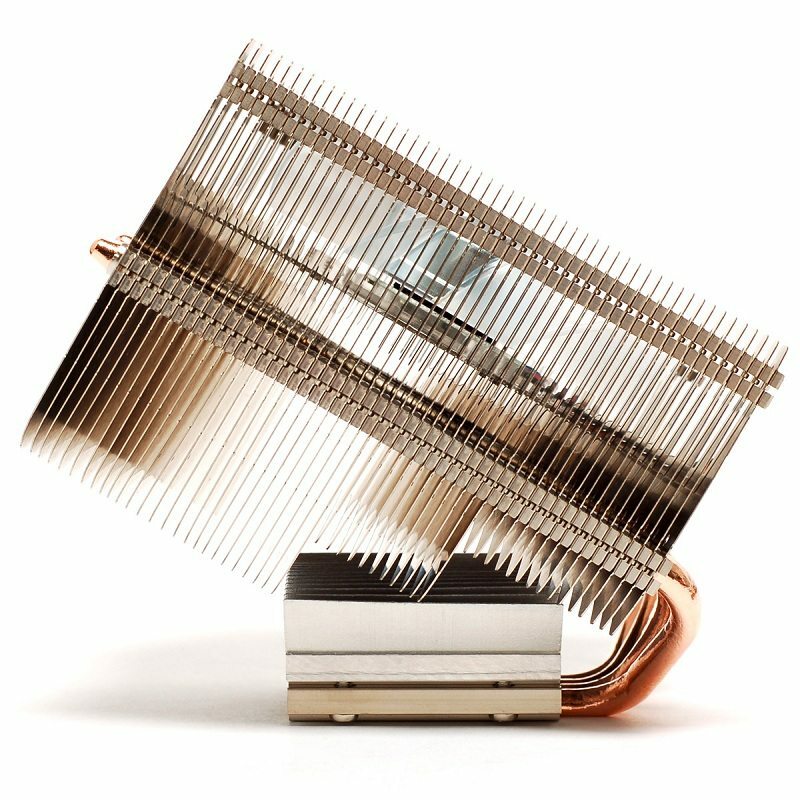 The cooler features four 6mm heatpipes that actually make direct contact with the heatspreader on your CPU, called HOC (heatpipe-on-core). 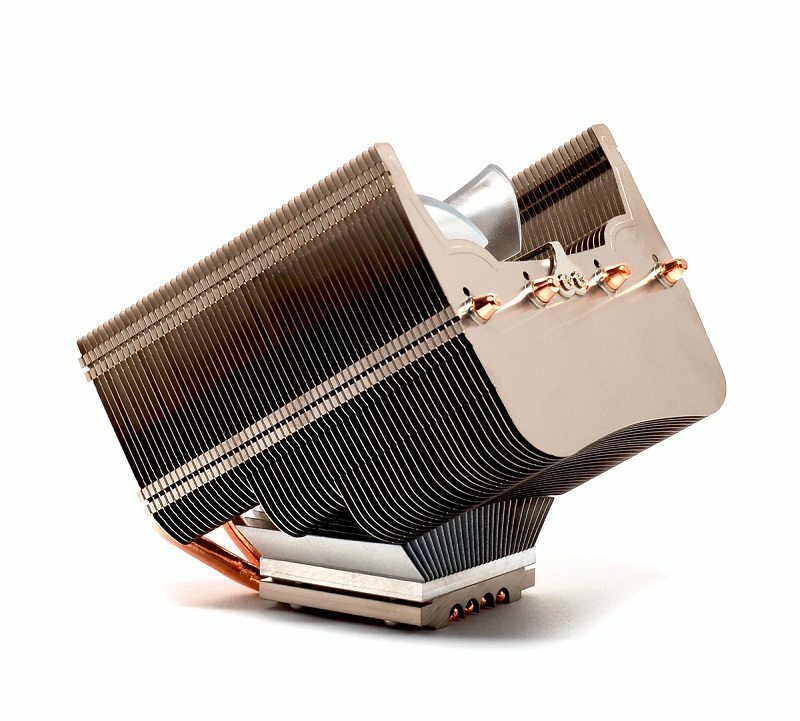 The FLC-3000 R2 also features SkiveTek heatsink technology which permits the production of a baseplate and fins with a single piece of aluminum or copper; this means no bonding, welding, or soldering. 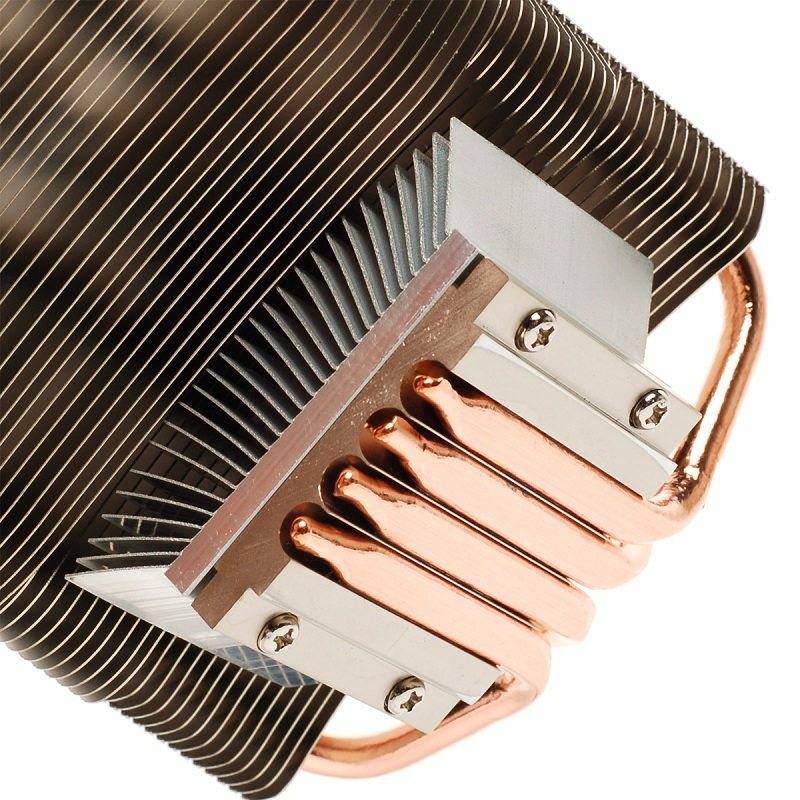 The FLC-3000 R2 is by no means a massive heatsink, it measures 128mm x 105mm x 119mm and weighs in at 450 grams. The angled design and the dimensions allow this unit to be used in home theater pc’s… where quieter is better. The FLC-3000 R2 is features pure aluminum fins, 52 of them, that feel much sturdier than some of their competitions and is compatible with Intel’s 1156, 1366, 775, and AMD’s AM3 and AM2 socket types. The 92mm fan on this cooler is not surrounded by any loud graphics or plastic shrouds making it look like a 6 cylinder engine. Instead it is installed directly on the face without any interference, however, it does sport 2 orange LEDs for a small bit of flavor. The fan is capable of spinning from 900 to 2500 RPMS and will only produce 15 ~ 24 dB(A) while doing so. The fan speed is controlled by pulse-width modulation and thus delivers the proper amount of airflow for your task while keeping things as quiet as possible. 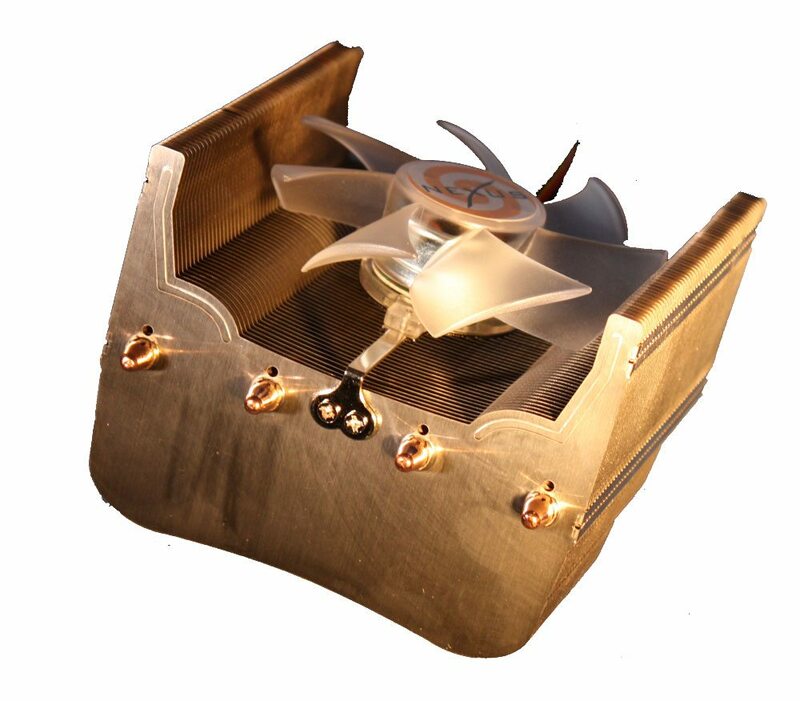 The fan is mounted with a mechanism that attaches at both ends of the cooler for a clean look, but it eliminates using any other fan save the one Nexus ships with it. If your fan goes… good luck getting a replacement. Thankfully, Nexus designed the cooler with installation in mind. For our setup, we installed the FLC-3000 R2 in our AMD based test rig. The installation instructions detail installing the clips on the heatsink, applying the thermal compound, and mounting the heatsink to the CPU. Luckily for us, the installation was far easier than that of the GlacialTech recently reviewed. The unit utilizes the already installed AMD backplate and there is plenty of room to tighten the clips.